We know, you love your betta fish! He’s like your baby right? Well every now and then it’s only fair if your betta fish gets a little treat. So, whatever the occasion – birthday, the anniversary of bringing him home, Christmas or even the celebration of doing your weekly water change – you should and will find a reason to give your betta fish a treat. What types of Betta Fish Treats are out there? One of the best ways to treat your betta fish is through his stomach. They love good food! What is ‘good’ betta fish food? Well, in the wild betta fish feast on small insects and larvae from the water’s surface – this is what they love to eat. There are plenty of options out there for you try out which will certainly be a treat above and beyond the general daily betta fish food. Always remember to treat in moderation. Overfeeding is a very common cause of betta fish illness. And just like how humans shouldn’t live off ice cream these betta fish treats should not replace normal feeding. Yes, you can buy toys for betta fish! If your little betta is in need of a really good treat why not buy him a toy? 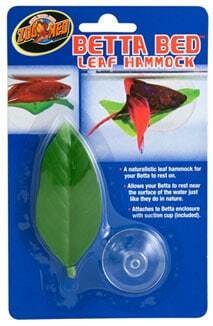 Give the gift of a betta fish hammock. A favorite toy of many betta fish owner’s is the betta fish hammock. A small, sturdy, plastic leaf that is suctioned to the side of the aquarium. Attach the hammock one to two inches from the water’s surface. This is a favorite position for a betta fish to rest his fins and tail and chillax. This floating toy is great for bettas. It gives them a hiding place, which they love, plus it floats meaning it stays in their favorite part of the tank – at the surface. Every now and then – usually 3 or 4 months – we give our tank a new look and layout and our bettas love it! The best opportunity for this is usually when the old live plants have started to fade away and you start thinking about buying new ones. Don’t just buy the same plants as previous, use this opportunity to do a big water change, re-arrange some tank decorations, try some new types of plants. Once it is all settled you will see a new wave of life in your betta as he excitedly searches around his new kingdom! You will then see why this is included as a treat. If you don’t already use live plants – then just updating your tank to include them will be a treat in itself. Try something really easy to care for like anacharis. How will you treat your betta? Caring for you betta fish is what being a pet owner is all about! Of course, that means spoiling them from time to time. So now you have read the many ways you could delight your betta with a treat what will you surprise your betta fish with? Is there a treat that we’ve missed? Share it with us and all the other betta fish owners that read our blog by adding it in the comments! We’d love to hear from you.